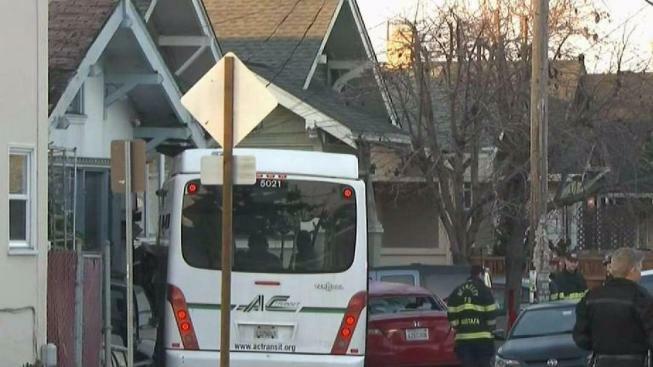 One person was killed in Berkeley Thursday morning when an AC Transit bus and car collided in a crash that sent the bus into a nearby home, according to police. Sharon Katsuda reports. One person was killed in Berkeley Thursday morning when an AC Transit bus and car collided in a crash that sent the bus into a nearby home, according to police. No other injuries were reported in the crash, which happened around 6:30 a.m. at the intersection of Ashby Avenue and California Street, Sgt. Andrew Frankel with the Berkeley Police Department said. The bus was travelling westbound on Ashby Avenue when it collided with a small sedan travelling southbound on California Street, according to Frankel. "The AC transit bus struck the red sedan at the driver's side," Frankel said. "The force of the collision drove both vehicles into the front of a residence on the 1500 block." Two people, including the driver, were on the bus at the time of the crash, according to an AC Transit spokesperson. They were not injured. Dale Reynolds was in his home when he heard the wreck. The vehicles involved wiped out his truck in the driveway and took out part of his front porch. "I heard 'boom,'" he said. "I heard 'bang.' I heard 'crash.' And then I heard the third hit which hit the house next door." Reynolds, who has lived in the area for 40 years, added that Thursday's crash wasn't the first in the area. He said previous wrecks have involved drivers speeding or failing to stop at stop signs. "It's like a freeway," he said.